Make this seasonal salad an eye-catching grab-and-go item by layering all the ingredients in a Mason jar. 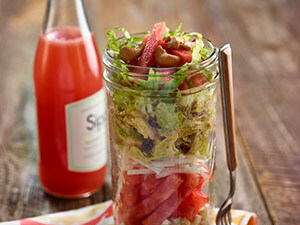 Swap out the jar for a clear plastic container if customers are taking the salad to a patio or picnic. Place chicken breasts in medium saucepan, cover with water and bring to a gentle boil over medium-high heat. Reduce heat and simmer until cooked through, about 15 minutes. Remove from water and let cool. Dice or shred chicken. Cook rice according to package directions. Refrigerate to cool. In medium bowl, blend mayonnaise, chutney and curry until thoroughly mixed. Add chicken, celery, onion and raisins; mix well and refrigerate. Divide rice and chicken mixture into 4 equal batches. In each jar, layer about 1/4 cup rice followed by 1/3 cup watermelon, 1/4 cup jicama, 1/3 cup chicken mixture and shredded lettuce. Repeat layers and top with 1 tablespoon cashews. Close jar and refrigerate until service.